optional: Download and install PIL. ReportLab supports JPEGs, but to add other image file types like GIF or PNG to your report you'll need PIL. Take a look at this PIL article from the Knowledge Base for installation instructions and how to use PIL on it's own within Vizard. For an introduction to the ReportLab PDF library and explanation of many of it's features with example code take a look at the reportlab-userguide.pdf from the documentation page. Save it to your computer by right-clicking on the file and choosing 'Save Target As...' (IE) or 'Save Link As...' (Firefox). For more example code take a look at the tests in ReportLab's subversion repository. 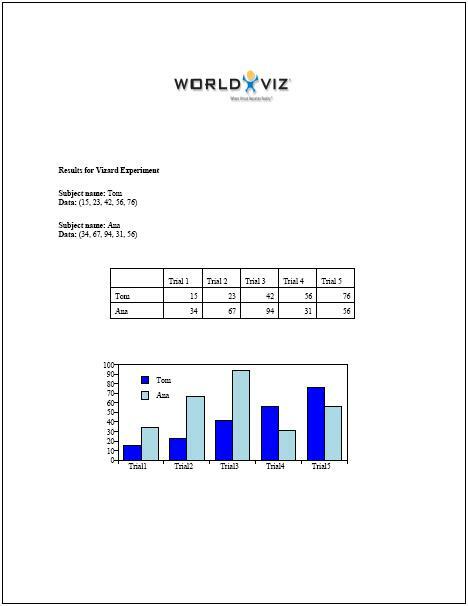 The following pdf file is an example of what you could do with your Vizard data. Here the data is displayed in paragraph form and then within a table and chart. The code that generated this follows. "Add sample swatches to a diagram."